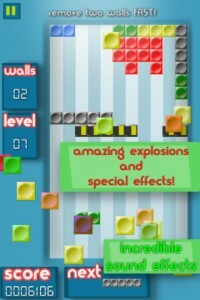 Blocks Up iPhone Game Review. 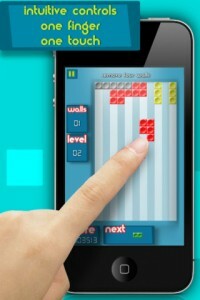 Fancy a game of upside down Tetris that won’t have you standing on your head or holding your iPhone upside down? Then Blocks Up is the iPhone game for your. While the game doesn’t excel at graphics or ingenuity, it does give you what you crave for: a simple and addictive game you can pick up and put down as easy as that. The game’s tutorial should be clear enough for everyone. Tap a piece to rotate it. Slide it left or right to make it move in that direction. Slide it upwards to speed it up. As I said, it’s just like Tetris, but with the game pieces flowing from the bottom of the screen to the top, where you must form lines, or walls as Blocks Up calls them. The way you create these walls is by lining up pieces on next to each other, without any holes. Once you create one of these walls, it disappears from the screen with a blast and a specific sound and the entire construction of pieces moves up by as many lines as you took out. 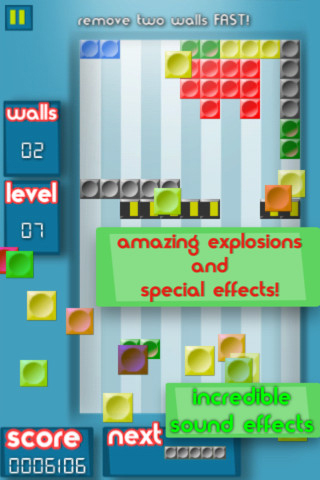 It’s a bit confusing that the game uses different-colored blocks. I would have expected to make more points if the wall I’m completing has only pieces of a specific color. At first, I tried playing the game by just creating the walls out of same-colored pieces. That proved difficult in higher levels, so I kinda gave up on the idea. It think Blocks Up can do with some powerups and some of these extra bonus points for users going the extra mile, just as I have. Blocks Up does have its own addition to the classic game of Tetris. It’s not a continuous play, but rather it’s divided into levels and each level will give you a different task to complete. The first few levels are easy-peasy. You have to take out 2,3 and 4 walls. The next levels will make you sweat a bit by asking you to eliminate more walls in one go. But where it gets interesting is starting with the levels that will put screen blockades in the middle of your playground and you have to direct the pieces to avoid those blockades and form the walls after them. So if the first couple of levels will leave you wondering why it’s so simple, give it a bit of time until you reach higher levels. 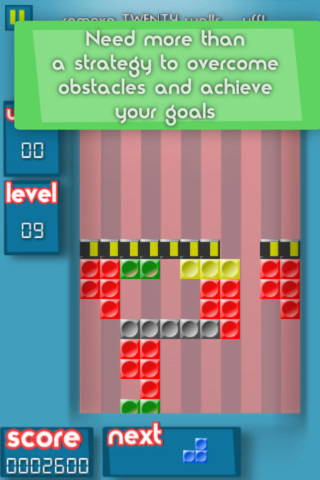 You can also turn the levels you’ve completed into an endless game mode, so that you can play a certain scenario until you’re fed up with it. You might remember the specific sounds the Tetris game made. They were just beeps coming from an (at the time) state-of-the-art-speaker on the back of your device. Blocks Up wanted to emulate that experience, but introduce music and soundtracks made out those beeps. I think it was a commendable effort, although I’m sure the user base will be quite split down the middle on this one. I personally enjoyed Por una cabeza by Carlos Gardel. You will definitely recognize this song from one of the best films of all time: Scent of a Woman, directed by Martin Brest. 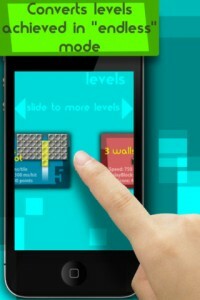 Blocks Up does offer you with a simple and addictive game, but it also left me wanting more out of it. Graphics that do the game play justice (if it’s retro, let it be a cool retro), GameCenter achievements and powerups are what this game is missing and why it falls short from jumping on the fast track to success. What do you think of Blocks Up ? Scroll down for our comment section and let us know!